There is much made of leadership. What it is, what it is no? What are the essential ingredients, what are the habits of successful leaders, how do leaders think, what do they read, how do they handle stress?…and the list goes on. But the reality is for all the similarities we find among leaders all leaders are different. Leadership is the ability to take a vision and translate it to an action plan with humility and tenacity. Everything else about leaders is defined by the individual leaders. So it bothers me a lot when the current shift in healthcare switches from physician leaders to non-physician leaders. Of course healthcare needs the help of executives who understand cost cutting end efficiency, but does that have to come at the hugely high price of eliminating physician leaders? Do we really have to turn physicians into technicians who with the help of a decision tree make healthcare decisions that are mostly just cost effective? Does the patient get lost in this effort, even while we throw in the mix conversation about patient satisfaction? Leadership requires a mixture of confidence and humility. The confidence you can solve anything thrown at you and the humility to know when you need help. No one person can solve all problems. Real leaders seek out advice and expertise when they need it. A good example of that is with current IT. Changes in IT are happening so quickly, that executives need IT expertise to help them make the hard decisions for their organizations. Future decisions will be dependent on the good foundation of IT decisions today. Most of what healthcare will be seeing in 20 years hasn’t been invented yet. 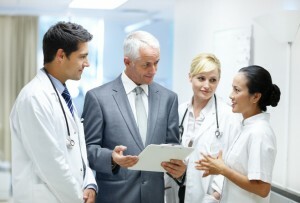 Leadership in healthcare also needs a vision toward the patients they are serving. Tomorrows patients will be older, better informed, and live longer, and for the most part, be outsourced for end of life care. Assisted living choices are abounding all around us. New choices for older Americans will occupy most healthcare leader’s agendas. Home care, visiting nurses and other providers will play a greater role. Leadership is at a critical point for the healthcare community. The ‘not for profit’ and the ‘for profit’ leaders of today’s healthcare organizations have very similar goals for the foreseeable future; how to do more with less.